If you are looking for some festive fun for your Christmas party then we have some great Christmas theme games and attractions that will provide the perfect entertainment. We provide entertainment for both corporate and family Christmas parties and while based in the Midlands are happy to travel further field. We have Christmas entertainments for the young and old, the quiet and the exuberant. 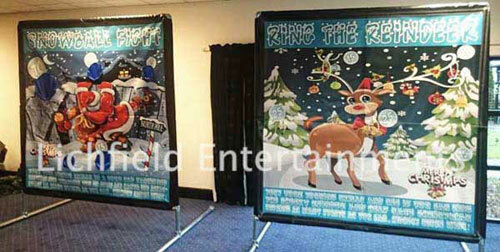 This includes Christmas theme green screen photo booths, the brilliant Rodeo Rudolph Reindeer Ride, Christmas themed Side Stall games, Snowboard Simulator, and the new Bouncy Snow Globe that can also be used for photos. As well as our regular side stall games we have these festive themed Ring the Reindeer and Snowball Fight side stall games for some light hearted Christmas party fun. 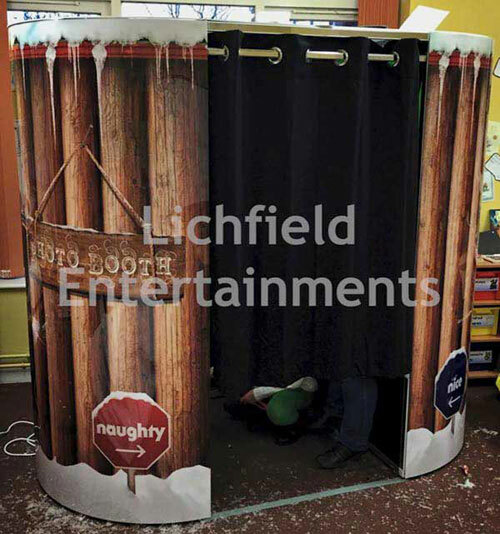 Our Christmas theme photo booth is a green screen photo booth complete with Christmas Cabin style booth shell. The green screen technology will make the users look like they've been photographed in various festive settings. It can be set to run with fixed Christmas backgrounds, or in Seven Theme where Christmas is one of seven different themes users can choose between, or in Green Screen Dream machine modes where Christmas is one of many, many different themes. All modes produce an instant print for your guests to take away and we provide a USB stick containing digital copies of all photos for the event organiser. The Rodeo Reindeer is a Christmas themed variation of the normal rodeo ride. 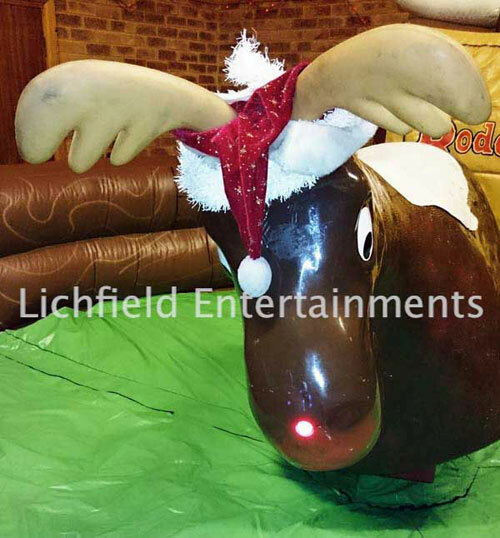 Complete with festive hat and flashing red nose how long can you ride Rudolph for? Balance challenging fun for the gnarly shredder Christmas party types! We are based right in the heart of the UK so are happy to supply both corporate and prviate Christmas parties and promotions throughout the East and West Midlands, Cheshire, South Yorkshire, Shropshire, Warwickshire, Oxfordshire and further afield. If you have any queries, questions, or would like to book any of the Christmas themed entertainments for your festive event please click here to enquire and we will do all we can to help.